The morning the Golden Globe nominations were announced, Ava DuVernay was in Toronto, having just premiered her latest film, Selma, and braving a heinous snowstorm. As the accolades for Selma came rolling in—four, including Best Director and Best Drama Motion Picture—DuVernay was stuck in the airport for three hours with the film's star, David Oyewelo, who plays Martin Luther King, before braving the snowy roads, racing for the border to catch a flight from Buffalo. A day later, DuVernay is in D.C. and contagiously chipper. Selma, which premiered at the American Film Institute last month, received yet another standing ovation in Toronto. The film, out on Christmas Day, chronicles the pivotal 1965 marches from Selma to Montgomery, which helped expedite the passing of the Voting Rights Act—the same legislation currently being dissolved by the Supreme Court. At the post-screening Q&A, DuVernay lamented the film's unintended timeliness. Paul Webb's original script focused on President Lyndon B. Johnson, with some emphasis on his conversations with Martin Luther King, she explained. After coming on board DuVernay changed its emphasis to the town—hence the film's name—and the Americans, from the South and beyond, who helped bring change. For her, this public groundswell has parallels with the present day, and the case of Mike Brown. (At Sunday night's New York premiere, the cast wore "I Can't Breathe" t-shirts.) "Unlike protests for Trayvon Martin or Eric Garner you're seeing people refer to it as 'Ferguson,' because there's a particular community solidarity," she says. "The parallels between the two are exciting and strange—there's something going on there I haven't felt in my lifetime and it's thrilling there can be change through strength in numbers. I know there's a reason there hasn't been a film, through a studio, with Dr. King in the central role in the 50 years since this event—it hasn't happened until now." DuVernay, a former publicist who started making films just five years ago, would easily cede to the idea that others who've come before her could have brought an MLK-centered film to life. She's had a charmed rise in her short but impactful career as a filmmaker. Like the rest of her catalogue, which includes the Sundance-feted Middle of Nowhere and a branded short for Prada, Selma is a beautiful film that equally privileges aesthetics and narrative integrity. Her lens, cosseted by a dream cast including Giovanni Ribisi and Lorraine Toussaint and the painterly cinematographer Bradford Young, conjures grace in moments of pain and toxicity. It's the work of a director who is unafraid to feel. 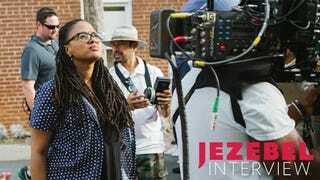 DuVernay spoke to Jezebel about being black women in, and on, film. Congratulations on the Golden Globe nomination. There's a lot of talk about you being the first black female director to be nominated. How much does an award like that mean to you? Thank you! It means that folks that need that validation, that sparkle and shine, before they venture to see the film will go see it. These awards amplify the film, and as a filmmaker and storyteller my goal is for film to be seen. Accolades help that. Personally, it's a little bittersweet since I'm not the first black woman deserving of the award. There are other women who came before me—Julie Dash, Gina Prince-Bythewood, Dee Rees, Lisa Gay Hamilton. I tip my hat to them. Why me? I guess this was the film and this was the time. I hope women in the coming years don't have to think about firsts or seconds or thirds, that they can just make their best work. I keep reading and hearing this particular phrase directed toward you: "There aren't many women like her." Whether in reference to Hollywood, film and even the rooms you're occupying—like the Globes. What does it make you think, to read that? I know it's not true. I'm not the only back woman like me; there are many women that I admire—black and brown women, women of all kinds, people in the quote-unquote margins, who are doing amazing things and telling beautiful stories. I may be the only one recognized by a certain gaze at this moment, but I'm not the only one doing the work. There's also Oprah, who stars in the film and is one of the producers. So now it's not just one of you in the room, it's two of you. You've said that part of what was incredible about having her there was that "no one says no to Oprah." What's it like to have an ally like her on the executive level? The film is not a studio film. It was made independently and distributed by a studio, so we did have autonomy. Nothing was a fight: it was the story I wanted to tell and I was invited and allowed to tell it, so I told it. But she was able to say, "We're able to let this black woman make this film, to not allow her vision to be compromised, and we'll support and protect her." To have that kind of champion is everything. The film that you see is my final cut, because of her. She's more than anything I thought one could hope for as a producer, guide and mentor. You were still working as a publicist up until three years ago before quitting to make films full time. So many creatives follow this path, but most stories focus on the success. How did you balance your curiosity and passion for filmmaking with the security of a day job? For me, it's a question of the way we pursue our creative dreams. There is something in our culture that says your dream or the thing you're pursuing has to happen immediately and all at once, and that is destructive to the creative spirit. I just embraced the idea that this was going to be a gradual exploration of the thing I was interested in—making films—and gave myself permission to go slowly. I didn't beat myself up for the fact that I had a day job. I considered how I could strengthen myself through my day job so that one was feeding the other. It's kind of like the very famous actor-waitress parallel. One time an actor told me that every time they approached a new table, they'd try a new character as practice. So I would sit in on other people's sets as crew and ask myself how I'd have shot that scene, and where my camera would be. American culture is the overnight success and "right now" mentality—it's just destructive, and we should resist it and go our own way. After seeing Middle of Nowhere, I remember being so excited about this one thing you said about the set design. The protagonist, Ruby, has this immaculate, well-maintained house, and you said something like "people assume people of color or those who live in lower income communities don't own or care about their homes." Can you talk a bit about how that logic extended to a film like Selma? Maybe nine out of 10 non-black people have never been in the home of a black person. To have the ability to show the interior spaces of a character is much more than the set itself. So you see a woman on a bus, coming home from night shift: what does her house look like? The Good Times set? You've never seen what a sister's house looks like inside, because you don't know any! For me, every piece of the frame is considered. I do think about that stuff a lot: Coretta Scott King's kitchen, Richie Jean's kitchen where they stir the grits and take her bacon and just take a break and laugh. The sanctuary of the Southern kitchen is just as beautiful as a white man painting a picture down the street. The art of the home is really important to me. In The Door, for Prada [a branded short starring Gabrielle Union], I wanted to show a different interior of a black woman's home, so it's an all-glass house in Malibu. I wanted to explore what that looks like and feels like when a black body inhabits it. I don't think of it as a responsibility, it's an honor—that intention gets embedded into the image, whether we're successful or not. Anupa Mistry lives in Toronto and writes about culture and communities. Holler: @_anupa.